All sessions will take place on Ormskirk Campus. The event takes place in the Business School Building (building no. 9). Plenary talks will be held in room B001. The parallel master classes and workshop sessions will be held in the same building, on the ground floor or level 1. The conference accommodation is within a five minute walk. We expect most IWMW 2015 delegates to arrive at the venue on the opening day and then walk to the accommodation after the talks finish on the opening day. 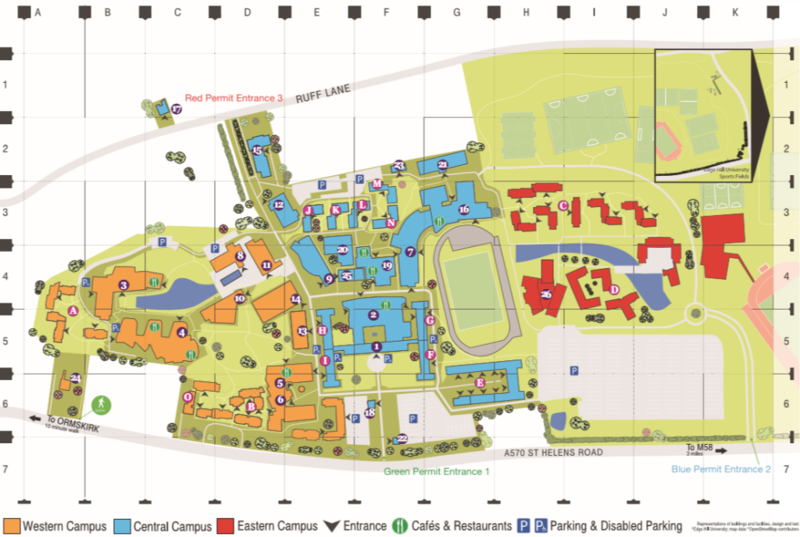 Note that you can view a map of how to get to Edge Hill University, Ormskirk campus (PDF format). Manchester and Liverpool Airports are both within 45 minutes drive. There are frequent bus/train journeys from Liverpool John Lennon Airport (code LJL) to Ormskirk (code OMS). There are frequent bus/train journeys from Manchester Airport (code LJL) to Ormskirk (code OMS). Ormskirk station is approximately 10 minutes walk from the campus. Liverpool Lime Street is the nearest mainline station. You can view further information about Ormskirk Merseyrail station. You can also use the Traintime service to view information on train times from mainline stations to Ormskirk. The full postal address of the venue is Edge Hill University, Ormskirk Campus, St Helens Road, Ormskirk, Lancashire, L39 4QP. The How to Find Us page on the Edge Hill University web site contains further travel information, including links to a road map showing the motorway connections. You should park in Car Park C – parking is available for free. Free parking in Car Pak C is available for those requiring parking on campus. Accommodation for IWMW 2015 participants will be provided in the Dewhurst and Holt halls of residence on campus (buildings B5 and B6 on the campus map). The rooms are all en-suite. Note that breakfast will be provided at The Hub. Delegates will be able to check-in when the rooms are ready. Check-out time is 09.00 on Wednesday 29 July. For those arriving on Sunday The Cricketers is suggested as a meeting place. This serves food until 8pm on Sunday. The suggested meeting time is 7pm. Further information is available on the IWMW 2015 social page.